Editor at Volcanica - focused on submissions focusing on observatory reports, communication, outreach, as well as everything on dome collapse and pyroclastic density currents. AGU VGP (American Geophysical Union Volcanology, Geochemistry, and Petrology) Section Webmaster. For up to date (usually) information of volcano hazards and activity around the world. Blogger on In the Company of Volcanoes. Founder of Voices of Volcanology. 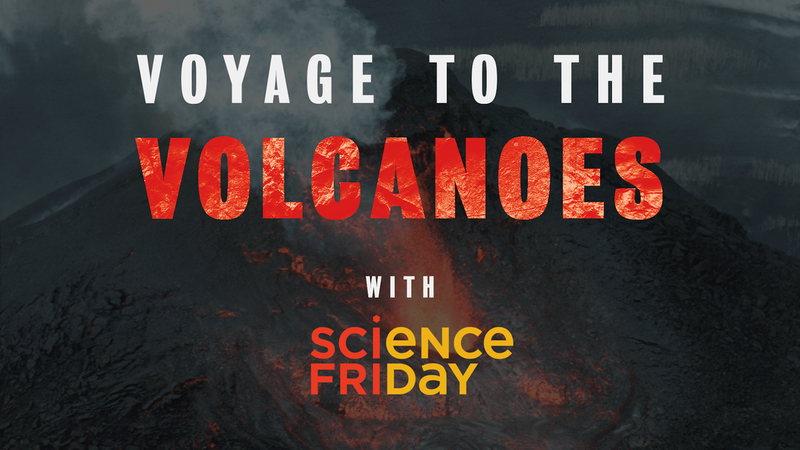 Take A Voyage To The Volcanoes With SciFri! On February 18 in NYC, volcanologists and author N.K. Jemisin guide us through an evening of quakes, shakes, and geologic events. 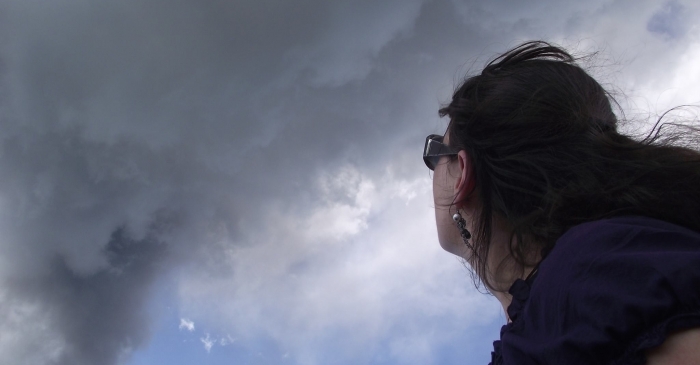 Adventurers who attend will experience an evening of hands-on experiments with disaster researcher Mika McKinnon and the SciFri team, and see what it’s like to work near an active volcano with volcanologist Jess Phoenix. The producers of the American Museum of Natural History’s Shelf Life will give us a behind-the-scenes look at the museum’s Experimental Petrology Lab, and volcanologist Dr. Janine Krippner will debunk the biggest volcano myths. Finally, Science Friday Book Club will gather ‘round the fire for a live interview with N.K. Jemisin, author of the Hugo Award-winning book The Fifth Season. safe management of the crisis." Communicating about Agung, how did that even happen? At the end of 2017 I dropped everything in my life to communicate the Agung crisis online. Just me, my two cats, and my laptop at the kitchen table. All night, every night, for just over three months. I am going over the notes that I took during the Agung crisis in order to prepare a talk that I will be giving at the Cities on Volcanoes conference next month. From the beginning, it was very clear to me that this was something that we, as a global volcanology community, need to learn from. During the crisis I took a lot of notes. I took screenshots of thank you messages (showing what was helpful), critics, hard questions, points of confusion, evolution of the eruption, and much more. This was all with the goal to one day learn from this experience so that the next time this happens, we will be better prepared (turns out it is already happening with the Kilauea eruption and USGS is doing a great job!). Castle and Minh are joined by Dr. Janine Krippner to talk about the vast world of volcanology, the recent Kīlauea event, social media, and risk communication. "I blurted out the above statement during a lightning talk recently at the Northern California Earthquake Hazards Workshop. I was presenting social science research conducted in Christchurch, New Zealand, during the Canterbury earth- quake sequence, specifically regarding earthquake forecasts and their communication. My statement was met with bouts of laughter and a few claps. Reflecting back, I regret being so blunt with my colleagues, but here is what the social science research suggests: Likeability and relatability are key factors in whether people listen to you or not. Relationships and relatability are essential parts of good communication; their importance tends to be undervalued in communicating science. Often we get so focused on our mes- sages that we overlook the relationship we have with our many diverse publics (or audiences, if you prefer). Jacobson (2003) found that focusing solely on our messages rather than the audience means that messages are doomed (at best) to be irrel- evant or (at worst) counterproductive. Brehm and Brehm (2013) argue that counterproductive effects include a push- back attitude against authority that results in reluctance to change. It is easy to understand; we can control our messages, but our likeability or relatability can include factors we simply cannot change because people have a wide variety of prejudices and biases toward gender, ethnicity, facial features, age, etc. But there are things that we can control, based on research, in terms of communicating when it comes to our likeability." A big blast could hobble global trade, communications and financial systems. “The next VEI-7 eruption could occur within our lifetimes, or it could be hundreds of years down the road,” says Chris Newhall, a volcanologist with the Mirisbiris Garden and Nature Center in Santo Domingo, Philippines. But the time to have this discussion is now, he says, so that researchers and government officials can plan and prepare before an emergency strikes. Newhall is the lead author of a paper published last week in Geosphere1 that explores the potential consequences of the next VEI-7 eruption. His co-authors are volcanologist Stephen Self of the University of California, Berkeley — with whom Newhall devised the VEI scale2 in 1982 — and Alan Robock, a climate scientist at Rutgers University in New Brunswick, New Jersey. All three have researched the VEI-5 eruption of Mount St Helens in Washington state in 1980, and the VEI-6 eruption of Mount Pinatubo in the Philippines in 1991. When Indonesia’s Mount Sinabung erupted on Monday morning, the volcano spewed a roiling cloud of ash and gases more than 23,000 feet into the air. The eruption prompted a “red notice” for the aviation industry, alerting pilots to the ash cloud so they could steer clear of it. But could tiny particles of volcanic ash really bring down an airplane? We need funding for natural hazards to prepare our communities and reduce the impacts. "Natural Disasters" do not exist. Natural hazards turn into disasters when people are involved, and often a lack of planning makes this much worse. ATHENS, W.Va. – Concord University along with five partner institutions has been awarded $579,998 through the U.S. National Science Foundation’s EarthCube program which seeks to transform research in the earth sciences via publically-accessible databases and online tools. The funded project is titled “THROUGHPUT: Standards and Services for Community Curated Repositories.” Other partner institutions include Columbia University, the Consortium for Ocean Leadership, Northern Arizona University, the University of Wisconsin, and the University of Minnesota. Dr. Stephen Kuehn, Associate Professor of Geology and Director the Electron Microprobe Laboratory, serves as Concord’s lead investigator. A major contribution to the project is information on explosive eruptions of Cascade Range volcanoes and of other volcanoes from around the world that has been collected by Dr. Kuehn and numerous Concord geology students over the last seven years. Data collected by researchers at other institutions will also be included. Concord has recently hired Dr. Janine Krippner to work on the THROUGHPUT project. 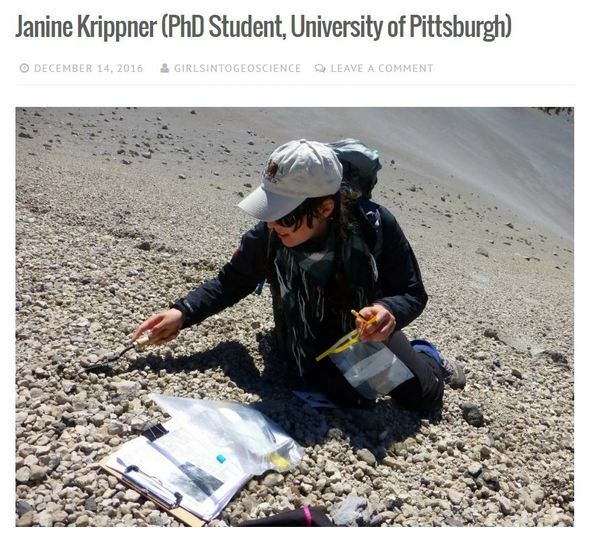 Originally from New Zealand, she recently completed her doctoral degree at the University of Pittsburgh where she studied pyroclastic flows from Shiveluch volcano in Kamchatka and from Mount St. Helens in Washington State. She actively engages in volcano outreach on social media and has attracted more than 11 thousand followers on Twitter (@janinekrippner). She has also been interviewed many times by both print and broadcast media including the BBC News, CNN, Discovery Channel, NPR, The Wall Street Journal, New York Times, National Geographic, and other media outlets around the world. Public presentations featuring Dr. Krippner’s experience with communicating the eruptions of Agung volcano in the Philippines are being planned for late February. For additional information please contact Dr. Kuehn at sckuehn at concord.edu or 304-384-6322 or contact Dr. Krippner at jkrippner at concord.edu or on Twitter. "Dr Janine Krippner, a New Zealand volcanologist based in the US, tweeted that the zone was "not referred to as the Ring of Fire because it sits there doing nothing". While there are fears that volcanoes are becoming more frequent, she said the rate of eruptions had "not recently increased". "We now have satellites to capture more eruptions, and the internet to talk about more eruptions," she said." What’s going on inside one of the Philippines’ most active volcanoes? Last weekend, the Philippines’ most active—and attractive—volcano, Mount Mayon, roared back to life. The 8,070-foot volcano began releasing spurts of incandescent molten rock and spewing clouds of smoke and ash into the sky, causing over 30,000 local residents to evacuate the region. By the morning of January 18, the gooey streams of lava had traveled almost two miles from the summit. Though the images of Mount Mayon are startling, the volcano isn’t truly explosive—yet. The Philippine Institute of Volcanology and Seismology (PHIVolcs), which monitors the numerous volcanoes of the island chain, has set the current warning level at a 3 out of 5, which means that there is ”relatively high unrest.” At this point, explosive eruption is not imminent, says Janine Krippner, a volcanologist and postdoctoral researcher researcher at Concord University. If the trend continues, however, an eruption is possible in the next few weeks. "No single thing, but the more research I did about academic publication, the more I was convinced that there was another way to go about things. Eventually that idea became a fully-fledged diamond open access journal! " So a team has been brought together to create the first Free to publish and Free to access Journal in Volcanology. I am very excited to be part of this team as an Editor! 'Volcanica is a broad-scope open-access international journal promoting research into all aspects of volcanology, including physical phenomena and their impact on society, health, and the environment. I have launched a public Facebook page dedicated to volcanologists reaching out to the online community as a reliable source of good information. This page is in its infancy but is open for posting volcanology resources and information. I see a gap in science communication on Facebook. Many of us are on Twitter, but keep Facebook restricted to personal life only. This is a place for us to help spread reliable information about volcanoes and hazards. Mt. Agung Update: Why is it so hard to predict a volcanic eruption? Indonesia’s Mt. Agung may be on the cusp of its first eruption since 1963, an eruption that killed more than 1000 people. Since late August, seismic signals have increased in frequency, and last Friday, officials raised the alert status to the highest level. Local officials have evacuated around 75,000 people from the area and warned residents to keep an 8-12 kilometer distance from the volcano. However, it’s still unclear whether—or when—the volcano may erupt, scientists stress. Volcanic eruptions are all about pressure—as buoyant magma rises through the volcano’s plumbing, the change in temperatures and pressures allows gasses to escape, putting pressure on the magma. As the magma rises more and more gas escapes, the pressure rises, until…BOOM! Scientists monitor earthquakes at the volcano, the gas it expels, and possible deformation of its surface for signs of an impending eruption. Increasingly frequent earthquakes as the magma moves are one of the main clues, and Mt. Agung’s seismicity has increased significantly in the last week or so. Much of the latest information on Bali's volatile Mount Agung is coming the long way around — from a Kiwi volcanologist watching an Indonesian mountain from Pittsburgh, US. Dr Janine Krippner is working through the night to read, analyse and disseminate the latest information from Bali. She reads tweets from volcano experts, monitors an online seismogram, interprets confusing graphs, and scours online sources for anything relevant. She began watching the volcano closely at the start of this crisis, on September 22, when Indonesian authorities declared a Level IV alert for Mt Agung and ordered major evacuations. She could not find the information she needed. "I figured people out there must be really struggling. I started getting comments out there from people saying they didn't know where to get information," she said. I am NOT giving my own interpretations of the data and what the data means. I am NOT, and CANNOT tell people what this volcano might or might not do. Please always refer to all official source links below. The utmost respect must be given to the local authorities monitoring Agung. I am not in Bali, nor am I an authority on Agung Volcano. I have not worked on Agung volcano, or any Indonesian volcano for that matter. Always look to the official sources for information, or to verify any information. For a list of official sources of information on the ongoing Agung volcano crisis go here. ​Join NASA volcanologist Rosaly Lopes and I as we talk about our careers and adventures studying volcanoes around the world. How many times are women told 'family or career'? How many times have we heard about women being treated differently because they have, or want to have, a family? We have heard that it's even a career killer. If we have kids - your career will suffer. Your kids will suffer. You will basically fail at everything. This is the message I have seen over and over again. I have a couple of issues with this. Firstly - I see women succeed at both. Secondly - I see plenty of Dads raising kids and having a career too! The old saying is that 'it takes a village to raise a child', so why do we have the stigma that women are the only ones affected by raising kids, and that it poorly affects their work? Read stories from parents in the geosciences who are making it work here. I have jumped on board with the Earth Science Women's Networks (ESWN) Science-a-thon to help raise funds for supporting the women in science of today and tomorrow. ​If you would like to support science and this great cause head over to my Crowdrise page (link below) and make a donation. "YOU MAY HAVE heard me say this before, but I firmly believe there are few topics more fundamental to study than the workings of our planet. The earth sciences aim to unravel how the lithosphere, atmosphere, hydrosphere, and biosphere operate—and how they operate together. It is a science of synthesis. And it’s one that needs to move forward, both because of the great service the earth sciences perform for society and the understanding of world-shaping processes that they advance..."
"@janinekrippner and @alisongraeting: Together, Janine Krippner and Alison Graetinger keep track of all the volcanic events that even I have troubling keeping up with. Beyond that, they run In the Company of Volcanoes as well." Why it is important to invest in volcano monitoring. We said never again. On 13 November 1985 a small eruption deposited hot material on to the snow-clad slopes of Nevado Del Ruiz volcano in Colombia. This set off a catastrophic chain of events. The hot material rapidly melted snow and ice, which rushed down the river valleys as a lahar (volcanic mudflow), accumulating material as it went, and plowed through the town of Armero. Around 23,000 people died, and more people and animals were caught in the thick mud. Some people and animals died quickly, some over several days after being stuck in mud and water, and trapped under debris. Omayra Sanchez, a 13 year old girl, was trapped for ~60 hours before she died. Her photo shocked the world. Today marks another anniversary of the deadly eruption of Mount St. Helens volcano in Washington, USA. This eruption was one of those events where most remember where they were around the world when they heard the news. It changed the lives of those around the volcano - those who lost friends or family, their homes, their view of the local landscape, and their belief that 'it won't happen to me'. Thirty-seven years ago the world watched as the eruption took place, so what did they see? Two years ago I posted a list of resources on the eruption. This year I look back again asking what it was like for those who experienced the eruption firsthand? What did the rest of the country see through they experiences of reporters and those who were there? When the next continental-US volcano erupts some of us will be there. Some of us will have to clean up ash or mud (depending on the eruption type). The rest of us will watch the news and social media. This is how most of us are fortunate enough to experience natural disasters, and how many remember them. This collection of videos includes footage leading up to, during, and after the May 18, 1980 eruption of Mount St. Helens. Click here​ for post and video collection. I was sad to read about how girls from the age of six tend to believe they are not as smart as boys. "We are lucky that so many people post amazing videos of volcanic eruptions online for all of us to enjoy (see below warning), and we can learn a lot from them too. When I am looking at my satellite images of dome collapse block and ash flow and column collapse pyroclastic flow deposits on Shiveluch and Mount St. Helens volcanoes I have videos of these processes running through my mind. This is a short guide to what you are seeing in these incredible videos. WARNING: There are very dangerous and life threatening hazards associated with retrieving this footage, and here at In the Company of Volcanoes we strongly discourage anyone from trying to take your own.​"
I have compiled a list of teaching resources - activities, videos, datasheets, for teaching about volcanoes in the classroom. This is a growing list and I add to it when something new pops up. "I am excited about an upcoming set of Google Hangout sessions with 6th graders talking all about volcanoes, why they erupt, why some erupt more violently than others, what their hazards are, and what we, as volcanologists, are doing to try and help people that live near them. So I sent out a request to the world of Twitter and volcanologists (links to their twitter feeds included, also full of information and resources - many more twitter volcanologists can be found) from around the world got back to me with great ideas and resources, and here they are! " Join me on October 11 to chat about a career in volcanology, the 1980 Mount St. Helens eruption, different volcano hazards, and how volcanolgists monitor volcanoes to keep people safe. It's always great to chat to people about the volcanic activity around the world, especially when it's a rare glimpse into a remote volcano. Come say hello at the 2015 AGU Fall Meeting! I will be presenting "V23A-3066: The 2005 and 2010 dome collapse driven block and ash flows on Shiveluch volcano, Kamchatka: Morphological analysis using satellite- and field-based data" on Tuesday afternoon in the Moscone South - Poster Hall. Looking up at an ash plume on Sakurajima volcano in Japan. Beware of catching volcanic ash with your eye. 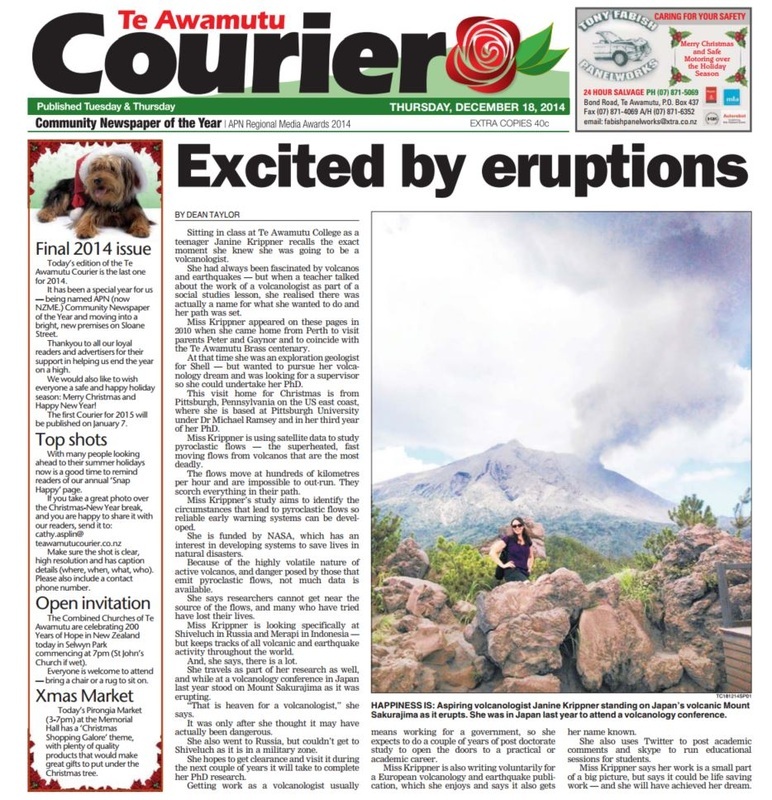 I was lucky to be picked this year to chat to the public about volcanology, in specific - Pyroclastic Flows. I will hopefully attend another session in the future, we clearly have some amazing kids out there with a love of science. My favorite moment was talking to a little boy who loves firefighting, volcanoes, and tornadoes about how I saw a baby tornado (dust devil) ON a volcano. A blog written with my good friend and fellow volcanologist Alison Graettinger. 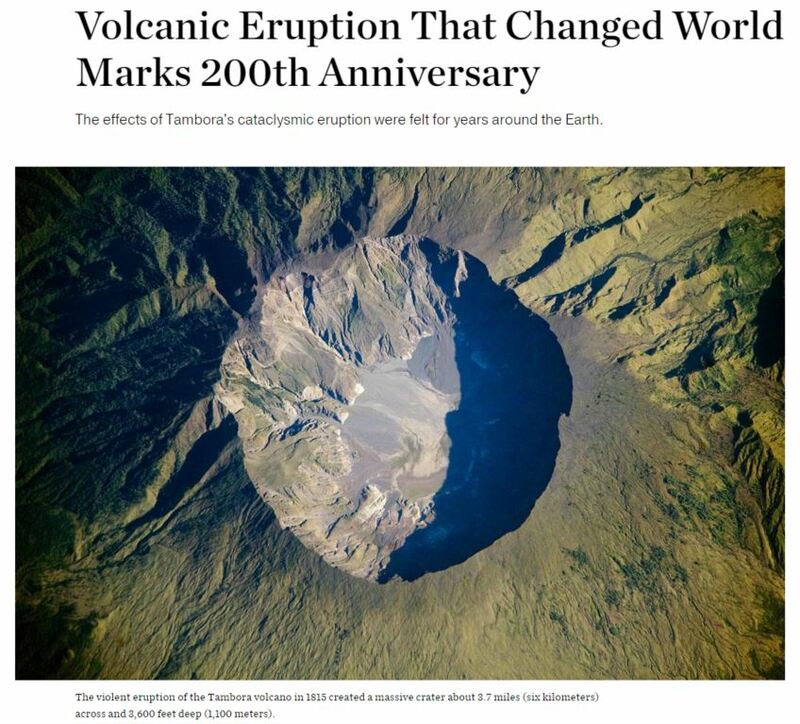 Quoted in National Geographic for the 1815 Tambora eruption 200 year anniversary. Small plume off Zhupanovsky volcano, Kamchatka, Russia. July 2014. Top Photo:1948 Ngauruhoe Eruption, New Zealand. Photo courtesy of John A. Krippner (My Grandfather).